Although it's not really a restaurant, the legendary Cafe Tamar can't be left unmentioned amongst all the others. 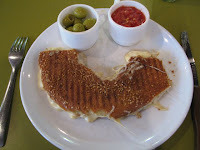 Situated in the poshy and bustling Sheinken street, Cafe Tamar is runned by an old excentric lady called Sarah Stern, since the British Mandate. It used to attract all Tel Aviv celebrities here and today some still come. Sarah will serve you her specialty: a bagel with cheese with olives and mashed tomatoes on the side. They also serve a good medium sized plate of Israeli salad (chopped cucumbers, tomatoes, onions and parsley) and sweet pastries, like popseed cake, croissants and different kind of cookies. It's on Sheinken street on the intersection with Ahad Ha'am (on the side of the street which is closer to Rothschild blvd). 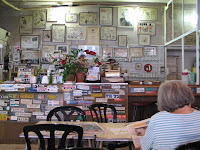 * Detail: on the wall behind the counter you will find caricatures of Sarah, made by the famous caricaturist Yaakov Zeev Farkash, who made caricatures and cartoons for 40 years in the Israeli Ha'Aretz newspaper. The fabulous drawings of "Sarah gone on vacation" were made every year at Passover holiday.